You might know that my absolute favorite skincare line is from Rosette (review here). I felt I wanted to add something to my winter skincare though and this super cute Hadanomy Collagen skincare from Sana just kept popping up in all the online shops so I thought of giving it a try. There were 3 or 4 items available at the time I purchased these 2 products but now there is also a series of masks available (and I actually tried them but didn´t really like them that much). 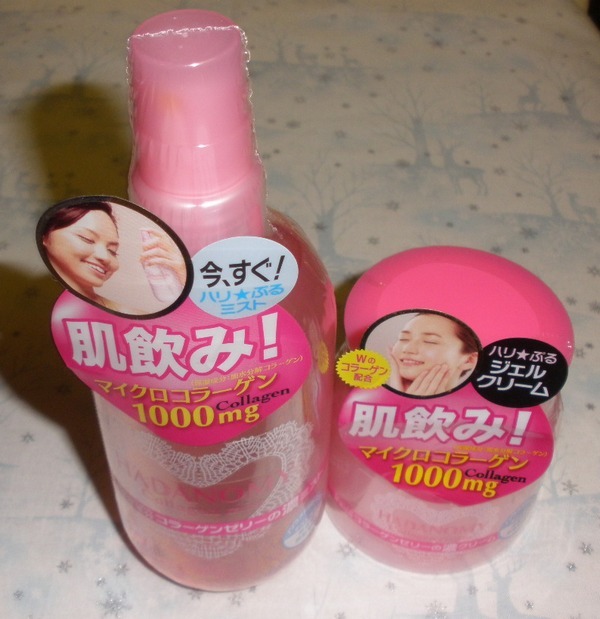 I purchased the Collagen Mist and the Collagen Cream to add to my daily skincare regime (cleansing or double-cleansing at night), Soys Lotion Rich, Soys Milk). 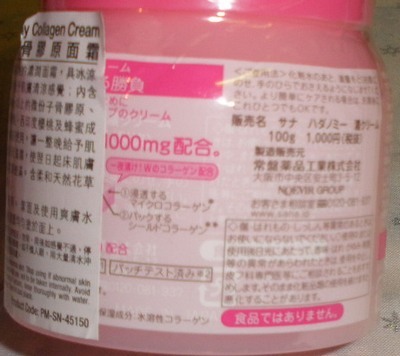 The Hadanomy Collagen range contains of course micro-sized collagen (1000mg...per ? 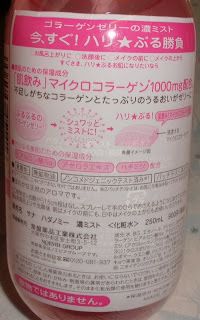 ), honey extract, hyaluronic acid and acerola. The products are free of mineral oil and colorants and have been allergy-tested. 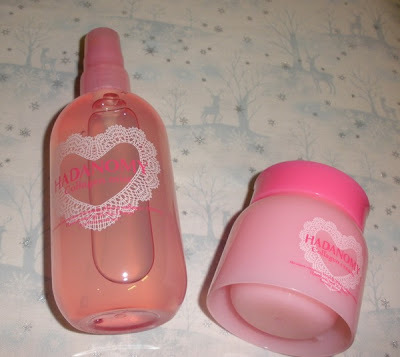 The Hadanomy products are scented, to me it smells like rose and something fresh blended in...orange or lemon perhaps. As I said packaging is simply cute, very sweet pink with white lace design printed on, made of a high-quality plastic. The Mist contains 250ml and retails for 900 Yen...that´s quite affordable given the good amount you get. It´s a liquid with a slightly viscous quality so it´s not completely runny like water but it´s much thinner than my Soys Lotion Rich which more reminds me of a liquified gel. This is also a nice prep for sheet masks, as it´s always recommended to use a toner before applying one of them. The Cream (100g for 1000 Yen) is actually more of a gel-cream than an actual cream. This is nearly only moisture but I believe low in lipids so on its own it´s not rich enough for me and my skin feels tight and uncomfy. However when applying this after my Soys Milk this is an excellent moisture-booster and skin-softener perfectly suited for the dry and cold winter weather. My skin stays perfectly hydrated and looks plump and radiant when using this skincare routine. 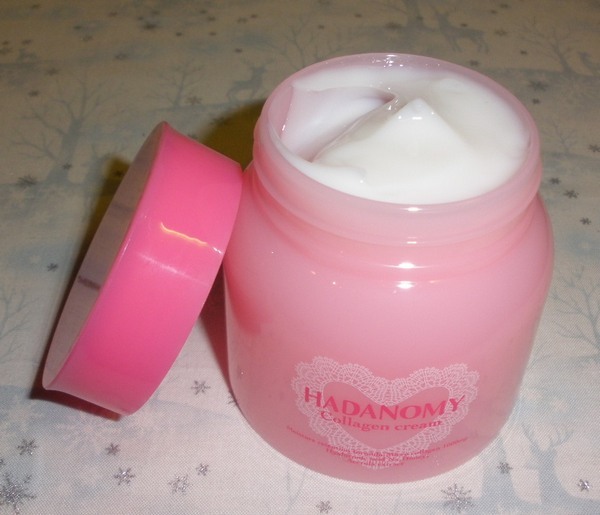 I have been using the Hadanomy range for about 5 weeks now in conjunction with the Soys line and have not encountered any sort of adverse reactions so I suppose it´s very suitable for my skin (allergic reactions or irritations never occur later than 2 weeks after starting to use a new product on my face, usually this shows in just a few days). Overall I am very happy with these products. The Mist isn´t really a necessary product since I already use another toner but I enjoy using it and there is nothing negative to say about it at all. The Cream is excellent and a welcome addition to combat the current temperatures. It might be too much to use this on top of the Soys Milk in summer though. love the packaging! Since I saw the chinese characters on the jar, i wonder if i can get them locally where i live too :D that'd be great!! The packaging is so pretty!! are you sure the line is free of mineral oil? the ingredient list on mine lists petrolatum high on the ingredient list, and mineral oil is liquid petrolatum. i have been using the cream as a booster this winter [gotta have some collagen booster XD] and i thinkit helps a lot! cute! Putting this on my list of stuff to try. the cream tub i grabbed was huge, ii may have accidentally grabbed the super sized version of it or something lol. but i love the texture! thank you SO much for the recs! i'm totally depending on your blog when i buy stuff in Japan! hye, i wanna ask, since u used this as the toner, did u used regular toner aka the one that u pour on cotton pad and slides on ur face?